The property we will see today is the realization of the owners’ dream of building a modern house in natural surroundings. 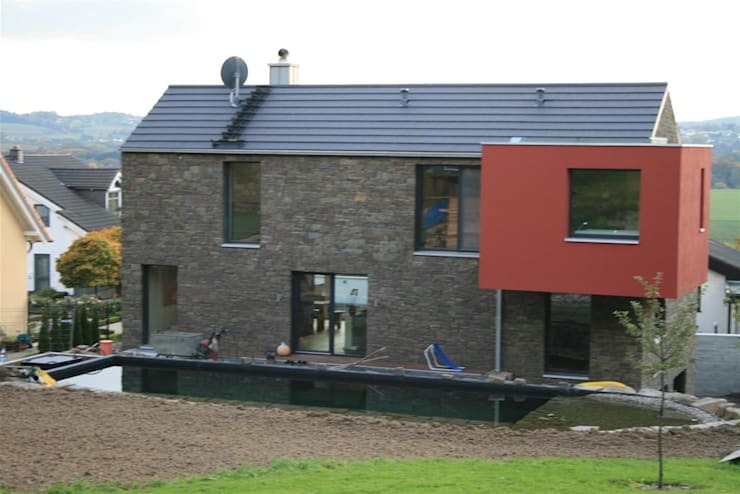 Thanks to the expert team of architects at Noesser Padberg Architekten GMBH in Germany, the large slope plot situated above the summer resort city of Königswinter is now the location of an elegant contemporary residence with a marvellous view of the Rhine Valley and the Siebengebirge. Let’s have a look! Located on a slope with a street view on one side and a valley view on the other, the cool grey and white façade of the house is trendy indeed! 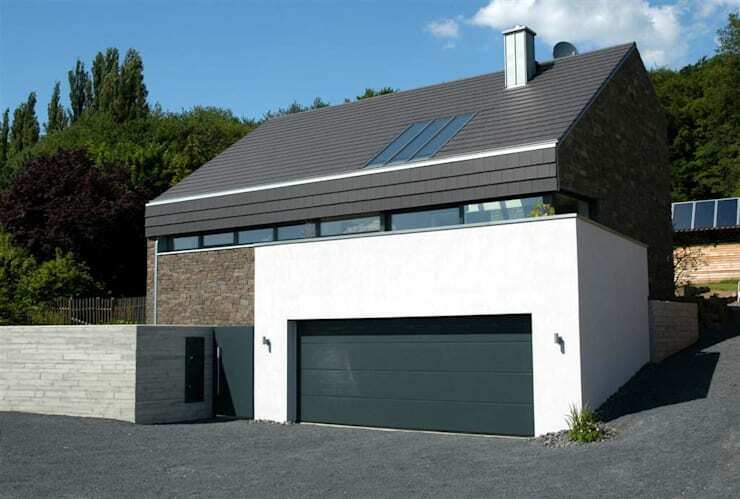 The elegant colour palette is enhanced by the use of multiple textures for the walls and roof. The asymmetrical roof is innovatively designed to run parallel with the slope while the sturdy stone walls meet the security requirement. 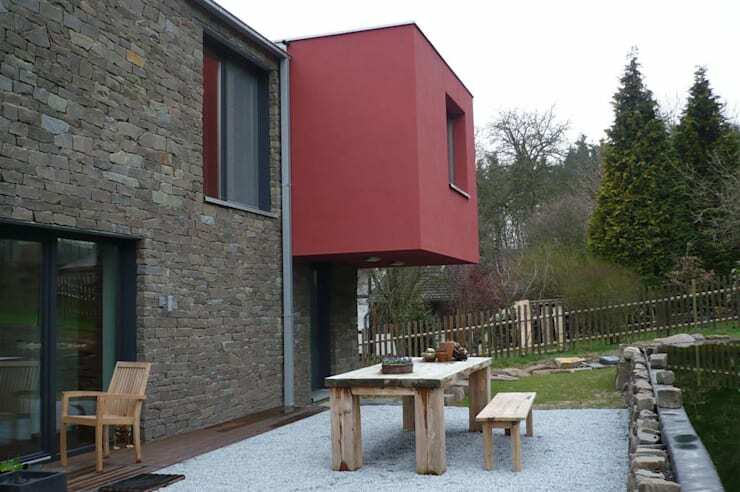 The back wall of the house is of a single stone texture that is relieved by large glass windows and is livened up by the striking inclusion of a vibrant red boxed shape that contains the bathroom. The patio, garden and pond are other elements that bring dollops of style and beauty to the house. The patio is a lovely feature of the house, with a beautiful view over the Rhine to the south and a view of the garden and the edge of the forest to the north. The rustic furniture is in harmony with the natural surroundings. What a wonderful place to relax and watch the deer on the edge of the forest! 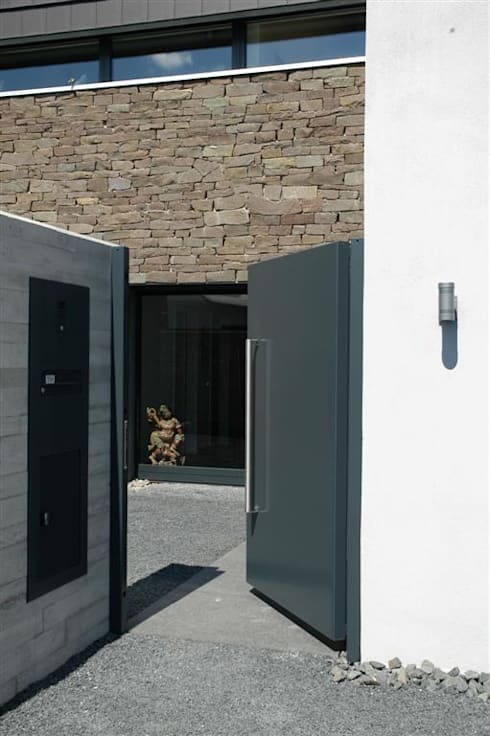 The solid grey door that lets us inside is contemporary and blends well with the gravel path. 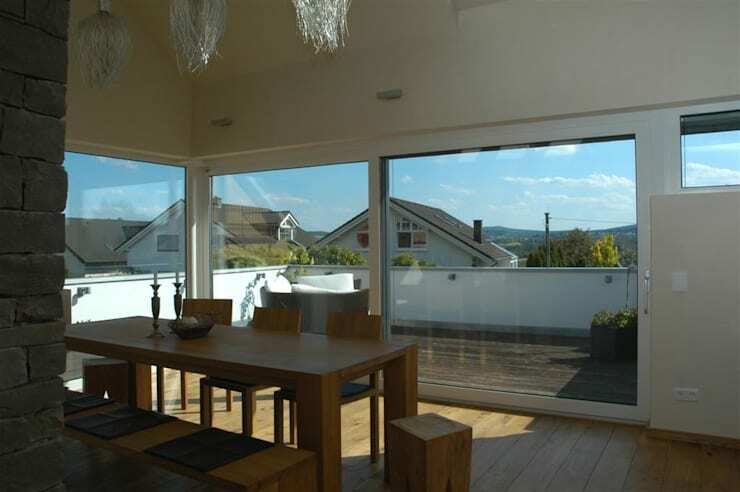 We see large glass windows that indicate the open-plan design of the house and let in ample natural light and fresh air. 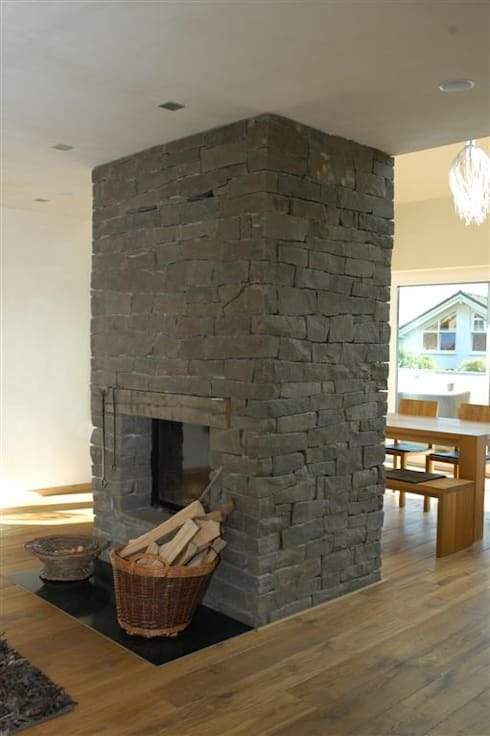 The uneven stonework of the fireplace matches the stone exterior of the house as well as the rustic theme within. The unique wooden stools are an eye-catching feature in the wooden dining arrangement. The candlestick holders on the table match the rustic theme while the vibrant painting on the wall livens up the sober warmth of stone and wood. Don’t miss the ingeniously designed lights – truly the highlight of the area! Here is another view of the dining area that gives us a spectacular view through the sliding glass doors that integrate the interior with the terrace outside. 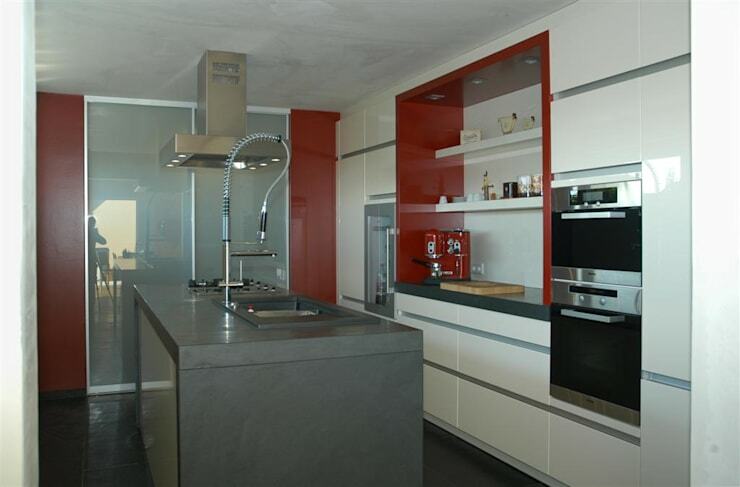 The kitchen combines the prevailing colour scheme of white and grey with red accents within a modern, functional and stylish décor. 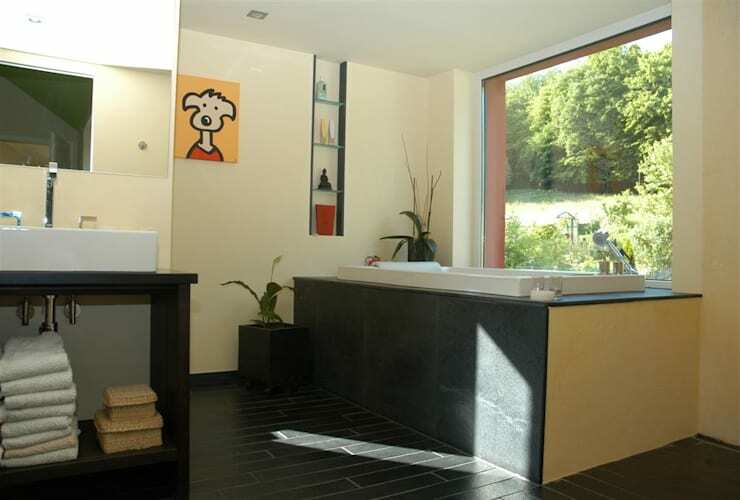 The bathroom is a comfortable and elegant area with a lovely stone-encased bathtub that has a gorgeous view of the outdoors. 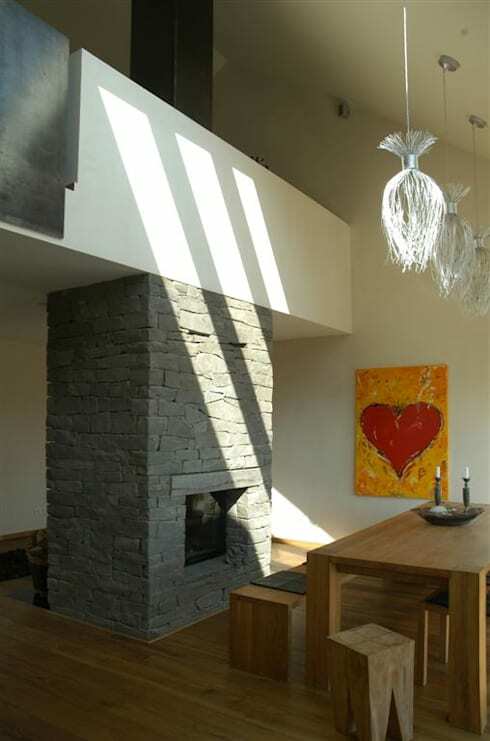 This modern house admirably combines rusticity and style in a natural environment. Take a look at another home that will leave you inspired - A charming cottage with cool contemporary decor!